This photograph was taken by the author during a harbor visit by a viking replica ship. Seems appropriate for prompts taking writers on an adventure. 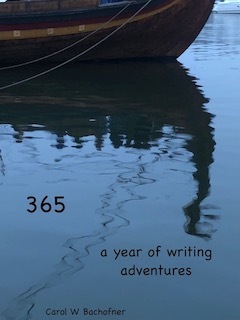 The 365 book originated as a writing discipline I undertook in 2012-13. Write a poem a day to prompts created myself. I made the commitment to create prompts at least a month ahead of the writing and to stick with those no matter how much I may be inclined to change on any particular day. And oh boy was I tempted. Some days I just didn't feel the prompt. However, when one sets out on a journey or rather commits to a discipline, it is important to stay the course or risk getting lost. I made TWO exceptions: one the day of the Sandy Hook school shooting and the other on the day of the Boston Marathon bombing. I felt I owed it to the victims and their families not to write anything other than what might honor them in some way. Below is the poem I wrote after Sandy Hook. It is unedited. As I continued to write through the year's prompts, I began to see myself as a more accomplished poet, finding the magic of ordinary things (and somewhat ordinary prompts) and gaining confidence. I also felt more settled into my writing as a normal part of my life rather than something I made time to do when other things were done. Another thing happened that took me quiet by surprise: As I began sharing some of the prompts in workshops writers became interested in having prompts for themselves, writing "mini-assignments" to work on after the workshop was done. I considered whether to publish some or all of my year's prompts on my blog, month by month, or as a collection. My decision took 6 years and hear it is. The prompts were originally just for poets, or so I thought until I began assembling them for this book. Lo and behold, they are all pretty well adapted for writers of fiction, essayists, memoirists. If you want to take on the challenge of a writing discipline, you do not have to invent it. It lives between the pages of this book. Dig in and do it! with the buttons on his shirt. cousin bringing cookies for the party? pop off his shirt as he falls to the floor. — and no time to call for his mother.